The party flag has changed only in details (and perhaps not officially) since 1993, at least. The symbol of U.D.T. is made up of the kaibauk, a traditional Timorese symbol of authority, topped by two typical eastern Timorese houses and four stars arranged in a half circle, representing the four parts of the territory and the lettering "UDT" arranged also in half circle in the bottom. The flag of UDT consists of five colors arranged in two vertical stripes, being the height [of the flag] two thirds of its width. The left [dexter or hoist] vertical stripe uses one third of the flag’s total area and consists of two colors arranged as follows: Blue, which is the background for the kaibauk, uses the two upper thirds of the stripe, while yellow uses the remaining. The symbol of UDT in the flag is always gold. The right [sinister or fly] stripe uses the remaining two thirds of the flag’s total area and consists of three colors arranged horizontally: green in the upper third, white in the middle and red in the remaining lower third of the stripe. Note: The Portuguese version of this document (official version?) used the word "estandarte", while Portuguese for "flag" is usually "bandeira". Both the image at the ETAN site and the offcial 2007 elections leaflet [t9l07] show a white door and window in each house of the emblem, angular tips of the kaibauk feathers, denser stars (with middle ones larger) and dark blue, yellow and red shades. The last two differences are possibly artifacts, for the party flag regulation explicitly prescribes bright/medium shades; he other differences are due to lack of accuracy in the previous image, made from the said regulation. The official Parliament website shows our old image from this page, with round tips on the kaibauk feathers. Here, large cloth flag, emblem detail below the fold and not visible; nice finial (very large image!). Here, large canvas panel hanging outdoors with slogans on flag design (with dimmed hues) and photo. Here, press conference supposedly after the 2007 elections, though date on the wall is 2002. Flag flying painted on the wall, fly section (with horiz. tricolor pattern) visible. Here, UDT flag hoisted at what seem to be the Same district party HQ. The text is not clear: Could be also Liquiçá, Suai or Ainaro. Here and here, decorative solid color "high" flags at party meeting in village ("suku"/"suco") Maitata. On this photo hosted at the official party blog, an old small U.D.T. flag with only the horizontal tricolor part and letters "UDT" in black sans capitals on the white stripe. On this photo hosted at the official party blog, the first party emblem, as of May 1974. No idea how it related to flags. On this other photo, old U.D.T. membership card with Portuguese national flag. These dating from 1974; belonged to old party member in Gleno village. On this other photo, the current party emblem, as seen on the cover of its current statues (2003). In the 2007.06.02 elections U.D.T. got 3753 votes (0.90%), receiving no seats in the parliament. U.D.T. got 8581 votes in the 2001.08.30 elections (2,36%), receiving 2 of 88 seats in the parliament. These results are very unexpected, as U.D.T. 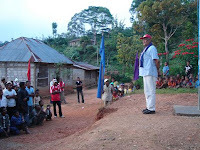 is one of the oldest East Timorese parties and was classically considered as #2 after Fretilin. U.D.T. is now #2 alright, but from the bottom. A new party, the Democratic Progressive League is announced to have been created in June 2007 joining all six smaller parties which received no seats in the Parliament. No news for now about an emblem or flag.